Klei’s Don’t Starve Together may have carried the beta tag in what feels like an eternity, but at least it’s seen a slew of both minor and major content updates in that time. The latest of these includes the Trade Inn, allowing avid collectors to upgrade an item in their collection to one of higher rarity. Groovy? More like… stylish! For those of you not in the know, the Trade Inn resides in the main menu, and is a purely cosmetic feature, in that the only things tradeable are of the apparel type (ie. clothes). Still a rather neat addition though, as I’m sure a lot of players – unlike myself – have built up a rather extensive collection, one full of duplicates and / or otherwise unimportant pieces. Well, now those have a purpose, as you can upgrade them! Get to upgrading! Upgrade! Now! 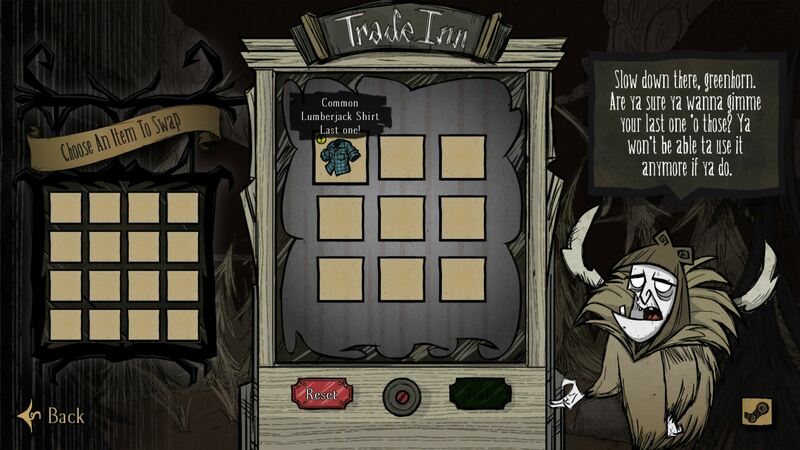 Don’t Starve Together [Early Access] is available from Steam, carrying a $14.99 price tag.